I really enjoy looking at the Periodic Table. I love the amount of information that is available in such a condensed form. I like the Table so much that I carry one in my wallet. There is one in the kitchen (in English) and one in the bathroom (in Spanish). As I was thinking about the periodic table I began to wonder what it looks like in Chinese. It just so happens that I work with a couple of Chinese guys so I asked them to show me a Chinese periodic table. I noticed right off that all of the Nobel gases had one shape in common throughout the family. Then I noticed that it wasn't just the Nobel gases but all of the gases had the same character. Then I noticed that the metals had another character and last the non-metal solids another character. My labmate explained that in Chinese the majority if the symbols are made up from two parts. The first part (the radical) tells you what the physical state of the element is at STP. The second part is phonetic and tells you how to pronounce the symbol. I learned (after installing the East Asian languages on my computer) that there are four radicals used on the periodic table and they were the shapes I had noticed at the beginning. They are 金or 钅(literally "gold" for metal), 石 (literally "stone" for non-metal and metaloid solids), 水 or 氵 (literally "water" for liquids), and 气 (literally "air" for gases). The phonetic part is based on the western name of the element. Below you can see some examples of this radical phonetic symbol pairing. Here "metal" and the phonetic "bi" combine to form bismuth. "Metal" plus "nei" form "na" for natrium or sodium in English. I like this one because it shows that they aren't just using the English pronunciations of the elements. "Stone" and "dian" form iodine. "Air" combines with "fu" to make fluorine. There is set class of symbols which are for elements that were known since ancient times. Elements which were known to the Chinese alchemists like gold, iron, sulfur, and mercury. I especially enjoy the symbols for iron and sulfur. Iron can be broken up into several parts. Which could be interpreted "metal from the mountain for making weapons." Sulfur can be broken apart to show that it is a stone that flows. Lastly there are some characters that are descriptive of the element that they represent. Examples are phosphorus and bromine. Phosphorous breaks down to "the stone that glows" and bromine is the "stinky liquid." 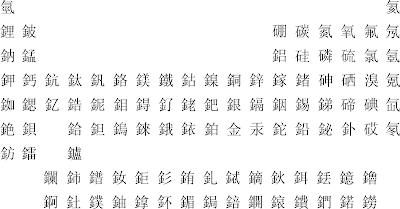 Some of the websites that I found especially useful are Zhongwen, a website about Chinese characters and their etymology, the Wikipedia entry on the chemical elements in East Asian languages, and an IUPAC article on the Chinese terms for chemical elements. DJ and I enjoyed your blog. We look forward to seeing your ideas for these test tubes you sent us. Thanks for thinking of us.